Photo by The Bond Experience. 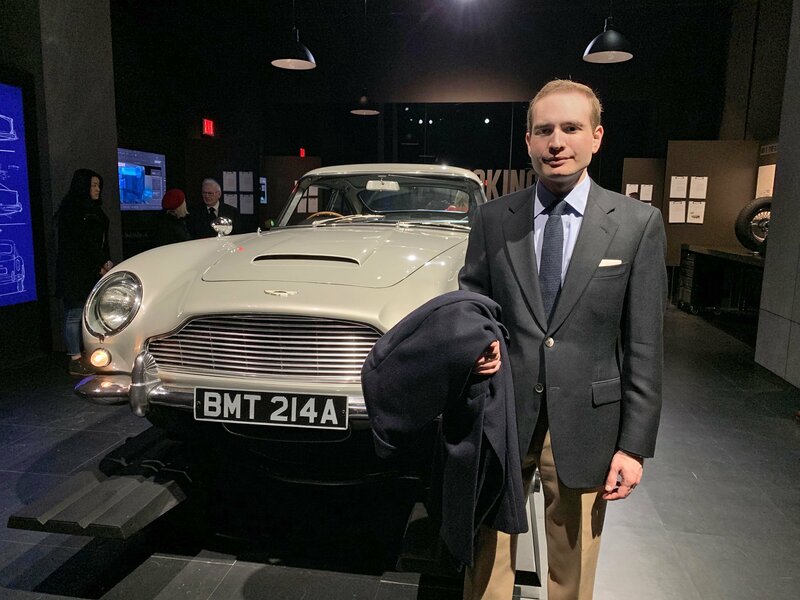 This weekend I was a member of a New York City James Bond tour led by the renowned David Zaritsky of The Bond Experience, including a visit to SPYSCAPE to see the new DRIVEN: 007xSPYSCAPE as well special visits as to Turnbull & Asser, N.Peal and Tom Ford. The tour started at the SPYSCAPE museum in Midtown Manhattan on the corner of 8th Avenue and W 55th Street, where the DRIVEN: 007xSPYSCAPE exhibition recently opened. 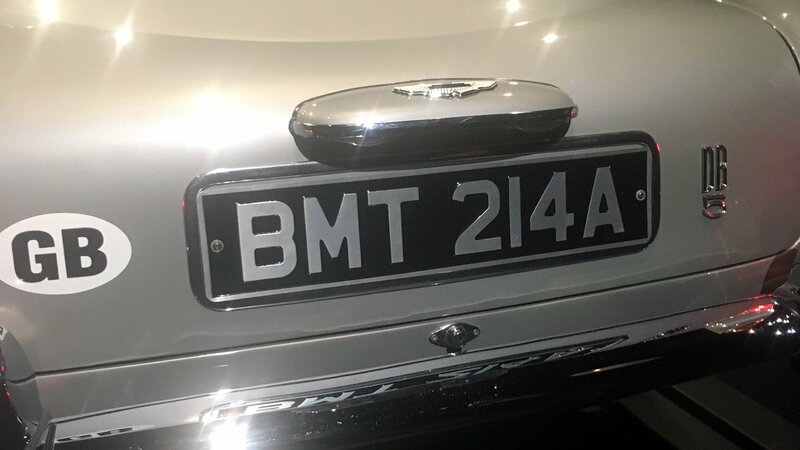 This exhibit is focused on the history of the Aston Martin DB5 thoughout the Bond films from Goldfinger through Spectre. Eon Productions archivist Meg Simmonds, who was involved with curating this exhibit, gave us a tour of the exhibit to provide us with some additional background on how the car was used in the films as well as about how the exhibition was put together, but there is no shortage of information in the exhibit. The beautifully curated exhibit breaks down the car’s gadgets and includes a model of the car blown-up in Skyfall. Sadly, there are no Bond clothes at the exhibit so you will need to wear your own, but it is a fascinating place to see quintessential Bond design and learn about the iconic car behind-the-scenes. 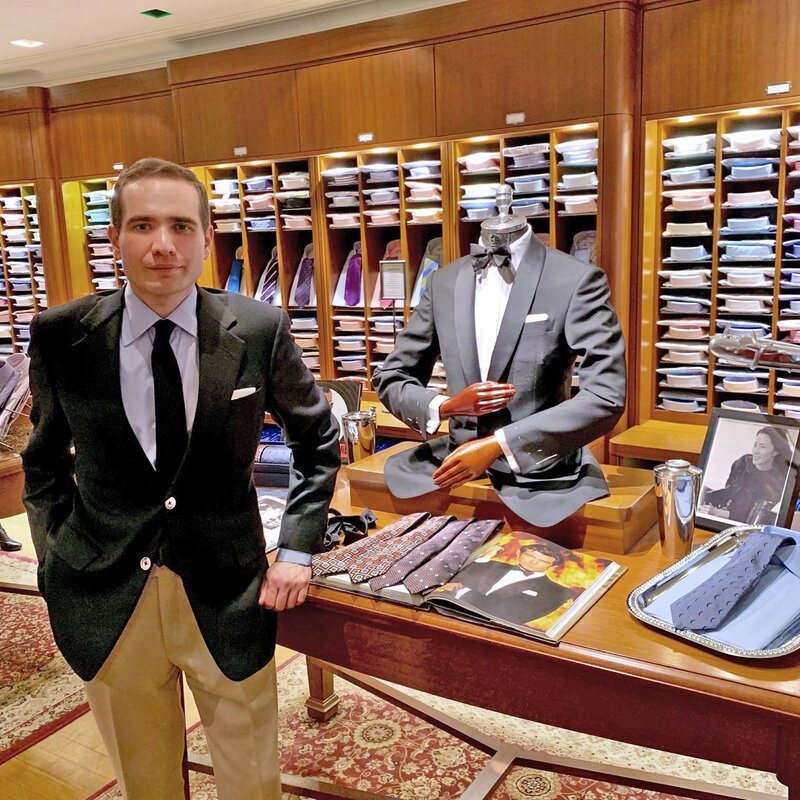 Daniel Stroupe of Turnbull & Asser behind rows of bespoke collar and cuff designs. Daniel wore his own turnback cuff design with a single large button while holding a sample of their standard two-button turnback cuff. Photo by The Bond Experience. 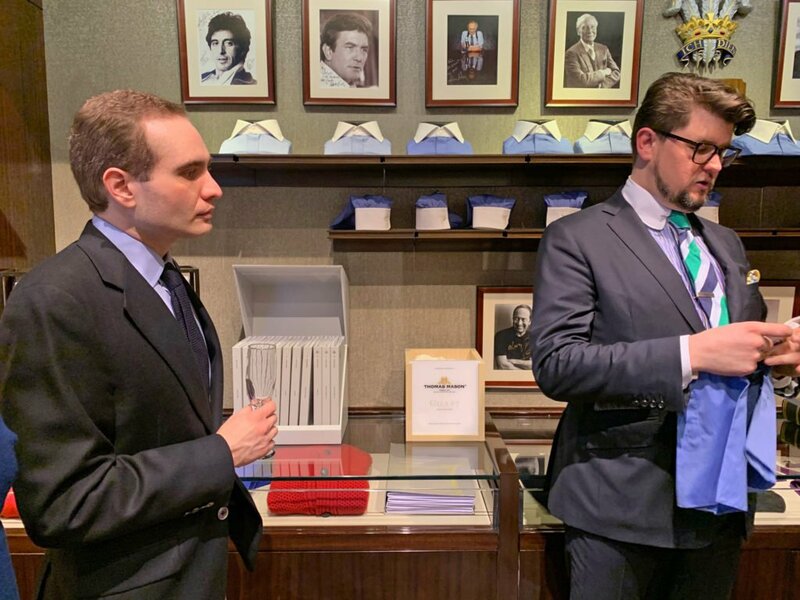 The first of the clothing shops on the tour was Turnbull & Asser on E 57th Street, an English shirt and tie shop that needs little introduction to Bond fans. 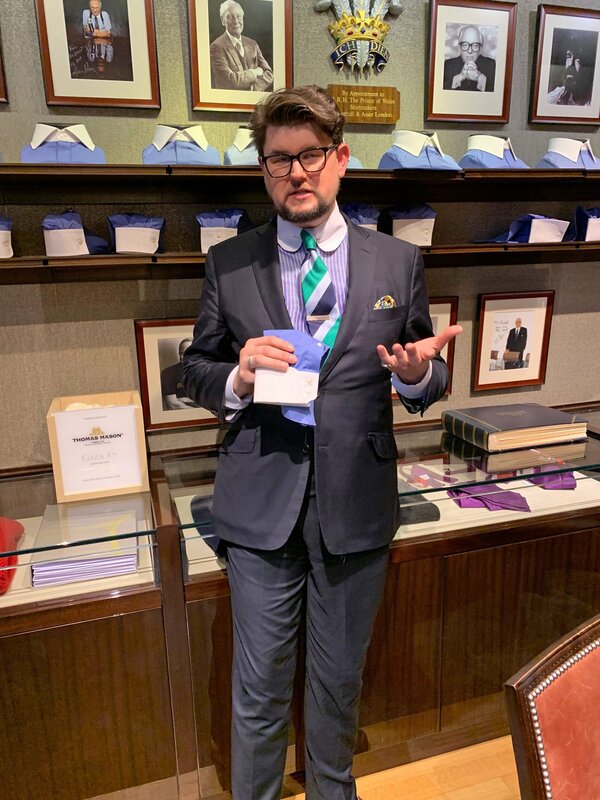 There, Bespoke Associate Daniel Stroupe gave us a tour of the New York shop and explained how the bespoke process works. 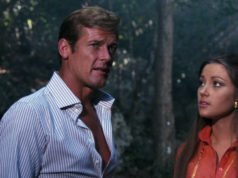 He spoke about the variations on the collars throughout the Bond films and how the Dr. No shirts they offer in both white and light blue poplin have a special taller version of the Regent collar that is very close to what Sean Connery himself wore. Me and Mr Stroupe in the bespoke department at Turnbull & Asser. Photo by The Bond Experience. They also offer the same shirt they made for Daniel Craig for the casino scenes in Casino Royale. Mr Stroupe told us that while Daniel Craig’s shirts were cut very close for the shots in the shower and jacket-less at the casino table, they were cut to be fuller when he wears them under a jacket for more comfort. He also said that in bespoke they can replicate Sean Connery’s turnback cuff design, which is different from their ready-to-wear design. Me, standing in front of the James Bond display at Turnbull & Asser. Photo by The Bond Experience. 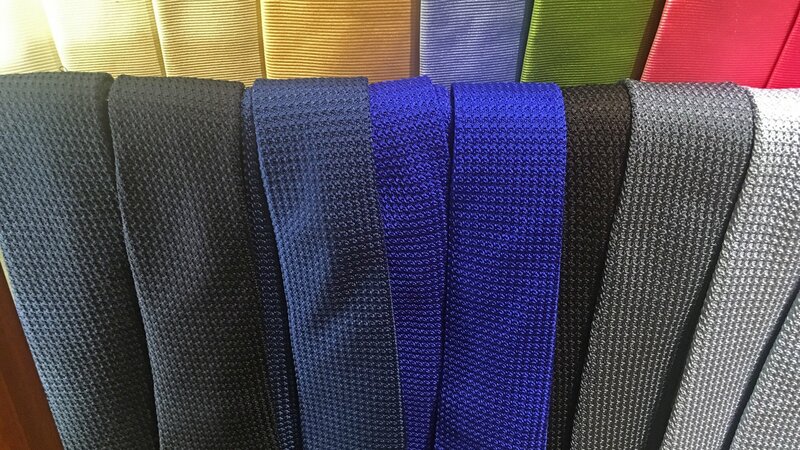 The blue James Bond grenadine ties at Turnbull & Asser. We then recieved warm welcome at N.Peal, who provided much of Daniel Craig’s iconic knitwear for Skyfall andSpectre. Last year, N.Peal opened a shop on Madison Avenue and E 75th Street to fill a void in New York’s luxury knitwear and cashmere market. Whether it’s a rollneck or crew neck jumper, a cashmere polo or a scarf, they have a complete selection of knitwear with excellent fits. They gifted everyone in the group a cashmere scarf. I left with an exceptionally soft mid blue cashmere scarf in such beautiful packaging that I hesitated to unwrap it! 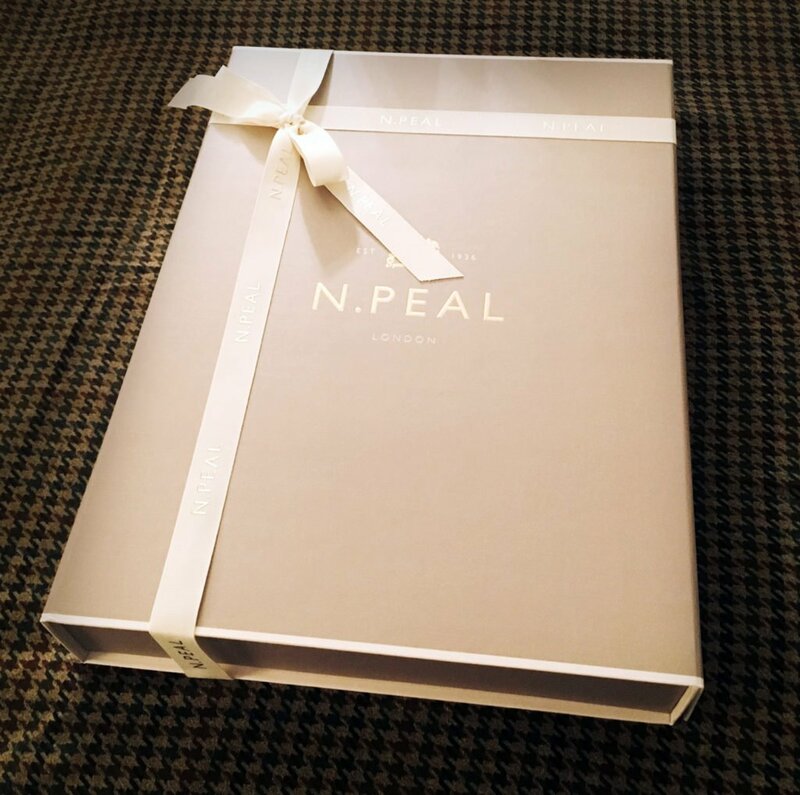 From inside the box: a blue N.Peal cashmere scarf. Photo by Darren Golda. 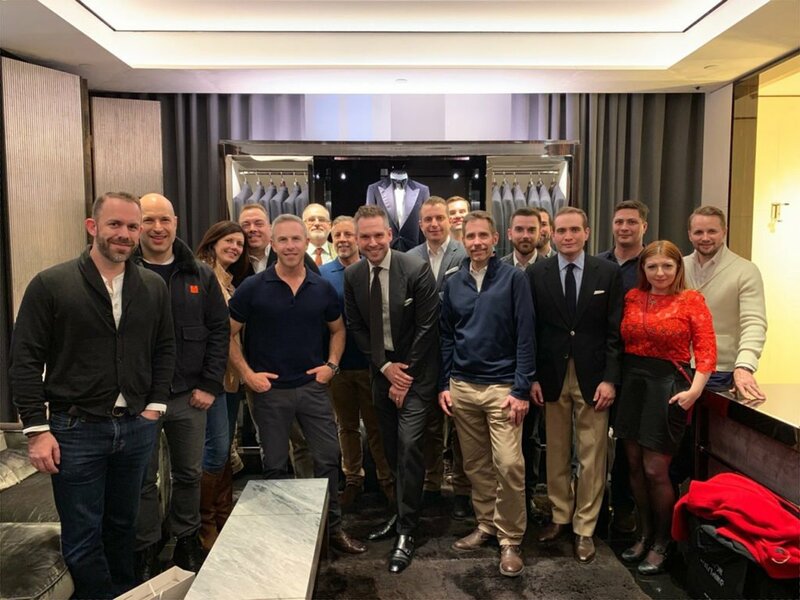 Our last stop was Tom Ford, where we were guided by General Manager Jordan Sromek and Director of Client Engagement Keith Scott, a legend of New York City retail. New York’s Tom Ford shop on Madison Avenune at the corner of E 61st St opened in 2017 to be in a busier location than their former location further uptown. The group at Tom Ford. Photo by The Bond Experience. Tom Ford provided Daniel Craig’s suits, shirts, ties and more for Quantum of Solace, Skyfall and Spectre. 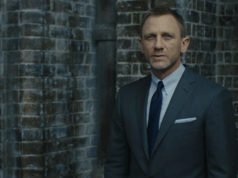 We saw James Bond items from knitwear to cufflinks, but the tailored clothes from the past Bond films are no longer available in their ready-to-wear collection. Their current suit collection includes the iconic Windsor, which is a classic fit suit with wide peaked lapels; the Shelton, which is like the Windsor but has a slimmer cut and softer shoulder, the O’Connor, which is a slim suit with narrower lapels; and the new Atticus, which has the widest peaked lapels of all the models and has slim trousers with a high rise. Tom Ford are able to make older models in their made-to-measure programme, including the Regency Base B suit from Quantum of Solace. 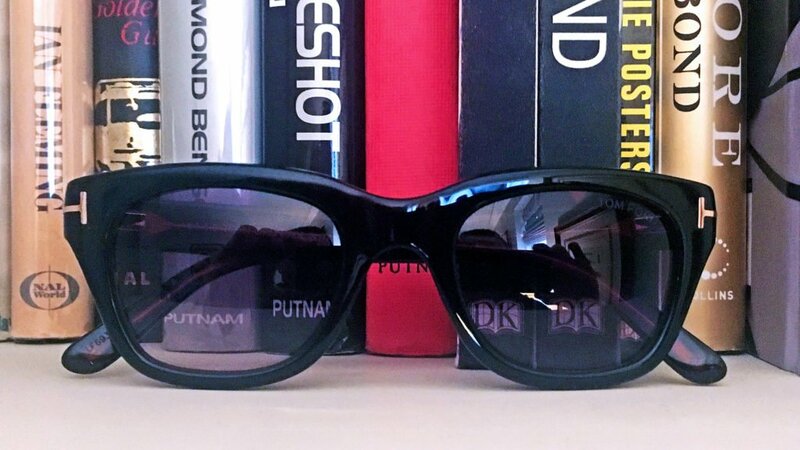 Tom Ford gave everyone a pair of sunglasses, and mine were pair of the Snowdon sunglasses, as seen in the Rome scene in Spectre. I like how these sunglasses work as well with a suit as they do at the beach. The New York Bond Experience is never complete without a visit to the Oh Cult Voodoo Shop from Live and Let Die. It is at 33 E 65th Street, near the corner of Madison Avenue and just four blocks up from Tom Ford and five blocks down from N.Peal. 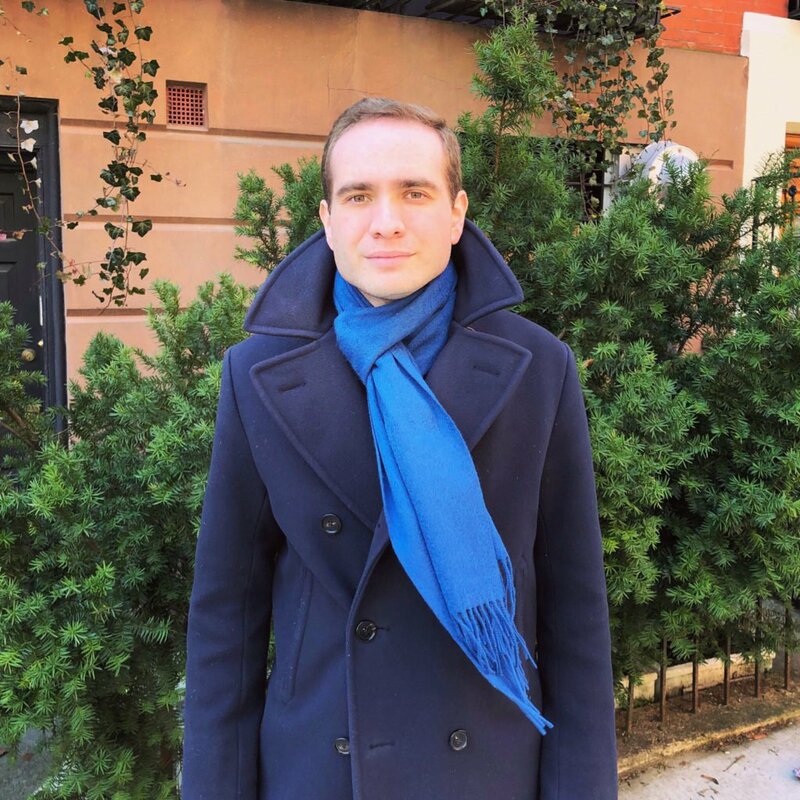 I just happened to be wearing my navy double-breasted overcoat (a British Warm rather than a more formal Chesterfield) and my Live and Let Die New York shirt from Frank Foster. Photo by Jeff Wybo of James Bond Canada. For those who are wondering, I am wearing a navy hopsack blazer from Canali with smoke mother-of-pearl buttons that I sewed on myself, my blue fly-front Live and Let Die shirt from Frank Foster, tan cavalry twill trousers from Mason & Sons, a dark navy grenadine tie from Oliver Wicks, brown Crockett & Jones Tetbury chukka boots, a vintage navy British Warm overcoat from the former New York clothier Wallachs, and brown leather gloves from Bergdorf Goodman. Look out at The Bond Experience and subscribe to them on YouTube for upcoming in-depth videos of the New York City adventure and to learn more about the brands featured here and more. I would like to thank SPYSCAPE, Meg Simmonds and Eon Productions, Turnbull & Asser, N.Peal, Tom Ford, and David Zaritsky for the Bond experience of a lifetime. I would also like to thank everyone on the tour for making this such a wonderful experience. This was a very personal Bond day for me, as I was able to enjoy everything I love about James Bond in my own neighbourhood. I’m planning on heading to new York to visit turnbull asser. So if I say I want the brosnan collars from twine, they would have a sample to show me ? Robert Gillotte knew a lot about this, but sadly he recently retired from T&A. Maybe the new bespoke team will be able to help you in your quest. Could you a please give me the link at your convenience? Matt, great article on our adventures that day. I appreciate you capturing all the details and the names of our hosts. I am ready for a return trip. Hope to cross paths with you soon. Great report Matt. I’m hoping to be back in New York with a new work project so will try to take time out to see the exhibition. (I always assumed the Oh Cult ship was actually in Harlem not in midtown!). 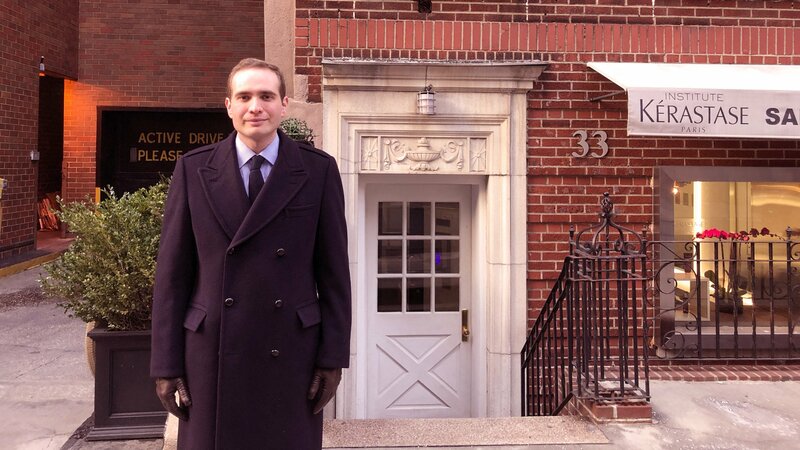 Tell us about your pea coat? The Oh Cult Voodoo Shop is in the Upper East Side, where many of New York’s best boutiques are. I got the pea coat from Polo Ralph Lauren three years ago. It has served me well! Looks like a fun day Matt, from one upper east-sider (PS 158 was my elementary school) to another! I have tickets to one of the Spyscape’s “Missions & Martinis” Bond Friday evenings, that includes a bar. 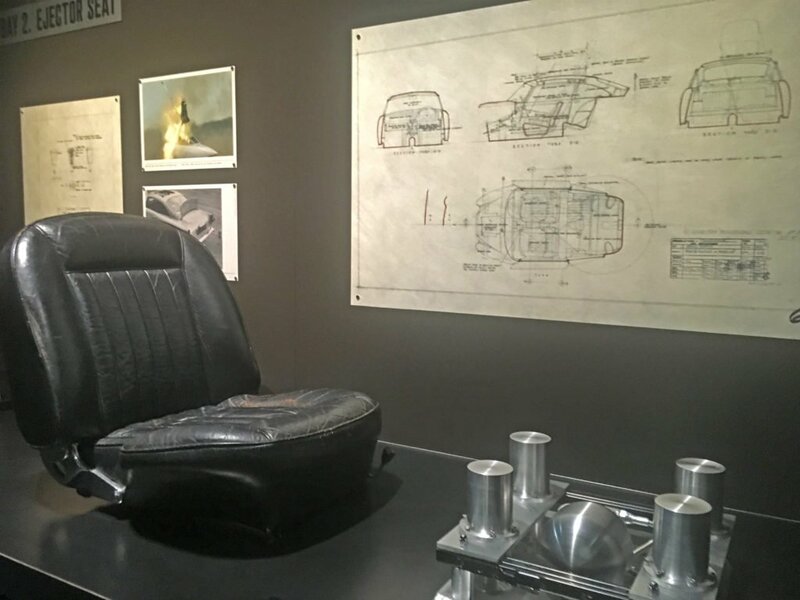 Is the Bond exhibit basically a room in the museum with the Aston Martin and Ken Adam’s production art? Judging from the photos, I’m assuming they allow flash photography? I wouldn’t want to miss any chances to pose with the car in one of my suits. I’m happy to hear you’re also an Upper East Sider! I did not grow up here, but I live here now. There are four rooms at the exhibit, the one with the Aston Martin being the largest. I do not know if they allow flash, but we took plenty of non-flash photos. I hope you enjoy it! Thanks – your choice of wardrobe for the tour and the swag they gave you was great! What was in the T&A swag bag? I saw there were a bunch lined up in one of the videos. Two newsletters, a sample of their Floris scent and a gift card! I called Tom Ford last year and asked about the Regency Base B, as seen in Quantum of Solace. Whoever I talked to didn’t know what I was referring to! They had to consult someone who specializes in MTM, who then told me they would need more time to make it. Probably due to them not having anything RTW to try on and get an idea of what adjustments would need to be made. They were all very friendly throughout the exchange, however. If I lived in NYC and had $6000 I’d certainly get it made! I purchased 4 bespoke shirts from T&A. Mr Stroupe measured me while he was in Chicago and has kept in touch with me regularly since. He’s a good guy. I’m happy to hear this! I understand he’s in Chicago again now. You have such impeccable taste, Matt! Thank you for providing us with this wonderful material! I am intrigued by Mr. Stroupe’s unique cocktail cuff design. It sounds interesting . Matt , did you take any pictures of it ? Does Turnbull and Asser offer this kind of cuff to their normal customers ? ( Bespoke of course ). I don’t have any photos of it. I’m sure you could get it from in New York’s bespoke department. I don’t know if they will do it in London, but it’s worth talking to them about it. What weight is your Cavalry twill trousers Matt? Does Canali still make that style of blazer? I have a navy hopsack blazer with peak lapels I like to wear for both business and casual. Even though the peak lapels are a different look. Very versatile though, I wear dark grey trousers for business and tan trousers for casual wear usually. The cavalry twill trousers are 18 oz. I don’t know if Canali still makes this blazer, but they probably make it a little different because fashions have changed a bit over the last 10 or 11 years since I bought it. Do T&A now offer to make the actual Connery cocktail cuff in their bespoke orders? I recall they used to not offer this in the past. Yes, they said they can do it. That was a fun video. Some inaccuracies on Mr. Stroupe’s part, although I’d be a bit nervous too if I had to give a talk like that with an expert like Matt (and a ton of other Bond fans) in attendance. Sometimes they play Bond music there in the NY store – would’ve been a good time to play some of those tracks when you guys had all visited lol.